The Content Marketing Continuum is my answer to almost every question in marketing today. When people bring me their challenges in marketing, it always comes down to, what I call the trinity of content marketing. The three cornerstone departments that power content marketing are Research, or documenting the MarketBase, Editorial, or documenting the KnowledgeBase and Marketing, which is documenting the FanBase. In the the following video and report (transcript of the video) which I created for a program called Zero To Money Making Website (part of a project called Passion Profits), I taught my students the same method we used in my businesses. The process is simple, consume, and produce. Document and opine. Generate traffic, and convert that traffic into subscribers and other members of the Community. The MoneySite sites at the middle of our efforts. It's the Website we have created to be the center of our network and our publishing machine. Outside of our MoneySite sits the World Wide Web; the whole-world of information out there in the form of other websites, channels, networks that people to distribute their messages and content. In other-words, the WWW contains all of the different elements that make up the entire spectrum of what we could possibly think of, work with or consider as it relates to the content, the topic, the objectives of our MoneySite. 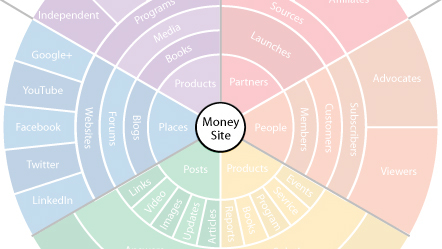 We connect to this world through our MoneySite and the content we publish through it. We do it by understanding three bases that I mentioned earlier. Each of these bases can be broken down into two major channels that we need to research and develop in for the purposes of producing our content marketing continuum. The MarketBase or Research Department, sets the foundation of research to be consistent throughout all 3 Bases. Research simply describes all persistent documentation of the bases to identify elements that we can learn from, in the case of the MarketBase we will focus on Places and Products that we can subscribe to or purchase and that we can potentially model. This MarketBase will serve as the initial foundation for both content creation and marketing and for many is where Content Marketing begins and ends. The KnowledgeBase or or Editorial Department, is the second step of the content continuum. This Base is built upon the Questions and Problems that exist in the market and of course any solutions that are already present or that we might provide in the course of our work. Building on the MarketBase, both bases' content creation starts with not only Market Research, but also Keyword Research as the “Keyword” is simplest form of an idea that can grow quickly together to form reports and articles and different pieces of content that we publish to address the questions and problems we find. The types of content we produce take the form of Posts and Products. Posts, such as Articles on our Blog, help our blog to gain search traffic. Rich media, like videos and podcasts, enable us to wow our audience. As a whole this content forms a KnowledgeBase that provides the basis for our community support and the marketing at the same time. It organizes our knowledge according to the problems that we find in the market so that we can solve those problems to serve our community. The final piece to the puzzle of this Content Marketing Continuum trinity is the Marketing Department in which we build our FanBase. The Marketing Department is multi-faceted and indeed is integrated into all 3 bases, but it's centralized around building this idea of the FanBase; which is comprised of all of the individuals making up the market who will end up consuming, subscribing to and sharing our content. We initiate connection with the People in this Base with the objective of continuing research but also for distributing our content or syndicating it. Communicating with and engaging our community creates this FanBase of people who are eager to not only consume our content but of those who would become advocates, associates, affiliates and joint venture partners that can work with us to not only continue to support our community but also to further distribute and syndicate our content. This naturally presents the vehicles of monetization of our content as well. Our new partners will promote our products, and we'll in turn also promote theirs. As people subscribe to our content, an even richer community and user experience is created and it all starts with the friending and following of these people that we find who are mixing it up, publishing-in and serving our community. Of course this process continues to involve engaging our fans and readers with the rich content from our growing KnowledgeBase from Base 2, based on the problems that we've found in the places and the products in the MarketBase in Base 1. This Content Marketing Continuum, as the name would suggest, consistently rotates between these three Bases or Departments. We are always researching and that research will always turn into content and that content will always be distributed, which acts as the basis of our marketing to engage the fan base with solutions to their problems and answers to their questions in the form of posts and products served through our MoneySite. And the cycle begins all over. This is why I call this concept covering all of the Bases of the Content Marketing Continuum. In the full video and report I'll walk you through how we actually go about this cycle and what these different segments of these Bases consider through the process of the Content Marketing Continuum.